Damien Hirst’s definitive sculptural piece ‘For the Love of God’ (2007) presents the monumental statement that finds absurdity in the perceived value and beauty of organic objects that transcends the usual economic constraints of demand and supply. Hirst focuses on a deeply-ingrained myth that appeals to the sentimental desire; of something universal and transient that can be achieved through the gaining of physical items: a curious narrative that exists in the materialistic desire of expensive diamonds, exclusively so (Twichell, 2000). With the understanding of desire as a community-wide bonding mechanism, artist Jean Shin’s more optimistic and humble endeavor to portray the hopes and dreams of the general public, very much amounts to the installation ‘Chance City’ (2001-09) becoming a self-contained visual diary, that finds direct linkage between the often misplaced hope of winning the lottery jackpot and the collective yearning for the so-called American Dream. Desire is considered by Shin as a coping mechanism that marries the hope for an idealised life with human resilience: the reality of a fragile existence is defied by humans through labouring and dreaming. (Shin, 2009). Leaning away from the spectrum of material gain, desire does play into the fundamental human yearning for identity and purpose, plus the wish to be sympathised with; an emotional presence that is both societal-intensive, but also primal and universal. Ron Mueck’s ‘Woman with shopping’ (2013) tells a story of normal life details that people miss, unless they are intimate with the subject and was keen enough to observe. Society’s heightened care around mothers with infant children portrays a respect and desire for intimacy, as well as the life-long societal relationships of learning about each other, and oneself. Thus, desire forms a relational bridge between the individual and the community, and the external influences of this relationship can be considered either questionable, or worthy of celebration and added commentary. De Beers’ ‘A Diamond is Forever’ slogan and its far-reaching narrative in marrying the diamond to the symbolic meaning of eternal love, is widely considered in the media and advertising world as one of the single most definitive campaigns ever conceived. Twitchwell’s assessment of this redirection of public perception of the diamond actively commentates on how advertisement narratives have reformatted the desire for the diamond ring into the desire to prove one’s love and one’s perception of their love’s worth (p88). With that in mind, Damien Hirst’s ‘For the Love of God’ (2007) is therefore a direct critique of the symbolic values of diamonds that contemporary society associates them with, while also contemplating the diamond’s manufactured meaning and its implications, since it has been widely pointed out: the diamond is an example of pure and expensive product of sentimental value. Twitchwell referred to this as a ‘paradox unique to [diamonds]: the very quality that seems to make them so valuable is precisely what must ultimately render them worthless. Not only do they last forever, but diamonds have almost no practical use.’ (p90). In addition to portraying that in his artistic statement, Hirst’s work also contained extra dialogic layers. 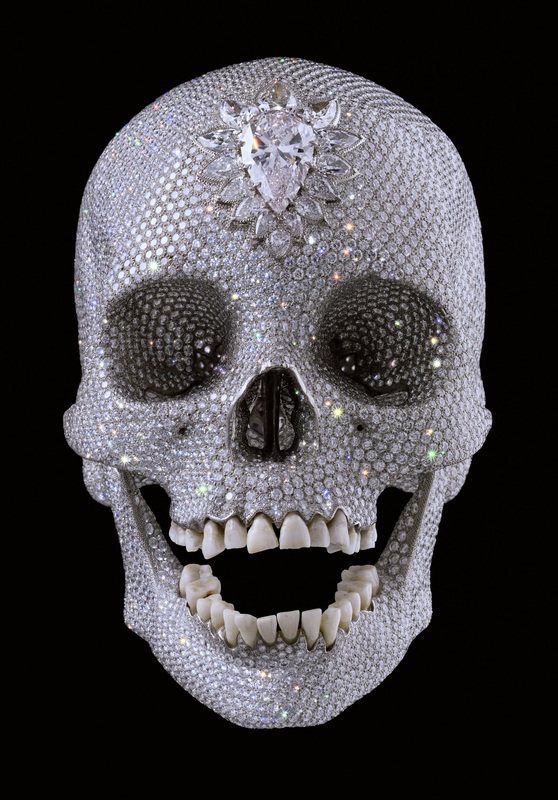 As its main structural personality, ‘For the Love of God’ is constructed of 8,601 flawless pave-set diamonds, weighing at 1,106.18 carats (Hirst, 2012), covering the entire under-layer of a human skull outline. Here, Hirst’s sculptural work plays with an intense visual aesthetic that comments on a realistic observation of the temporality of life, and the life-long struggles of covering up that inevitability of death with self-decoration, objects of sentimental (with/or monetary) value and a desire to find substance in living. Hirst explains death as: “You don’t like it, so you disguise it or you decorate it to make it look like something bearable…” (Hirst, 2008), His work here thus demonstrates a cultural construct that tries to subvert death with objects of transient beauty and desire, though it is also clear that ‘For the Love of God’ intends to question that specific association as well. The unsightly aesthetic of the human skull being completely constructed out of diamonds works in an image of disguising imperfection or something undesirable with decoration, while at the same time debating on the diamond’s inherent value: a face full of diamonds did little to lighten the skull’s association with death, and violence. Inherently, the skull’s association with violence also alludes to a cynical attack on the role capitalism played in manufacturing desire for diamonds, and the resulting discontent that came from human greed and ultimately the dark aspects of human nature: “[These stones] bring out the best and the worst in people…people kill for diamonds, they kill each other.” (Obrist, 2012). Therefore, Hirst’s work tells an elaborate story that very much despises the diamond’s apparently disproportionate price-and-value associations, but also solidifies it with meaningful symbolism and a lasting impression. There is validity in suggesting desire as a force that humans have a natural affinity to: it encourages the collective society to ascend further and beyond the status quo. As it seems, almost all of Jean Shin’s installation portfolio rides on a similar spectrum of depicting universal themes of normal people and the mundane experiences and life advances driven by desire. Such observations were immortalised through her work’s elaborate attention to detail and sense of simplistic but poetic storytelling. However, at the end, the intense work ethic displayed by Shin’s installation ultimately also works in the theme of human endurance. With the individual tickets representing the people’s dreams, the resulting monument that does stand with impressive outward impression, gives off a delicate sense of human struggle to find meaning in reality. At the end, ‘Chance City’ presents modern society as a fragile construct of chance and desire, but one that’s built from human resilience through time, in a never-ending search and desire for a better life. As it stands, desire production extends beyond the concept of materialistic gains. In its most fundamental form, desire is linked to the individual’s need to belong, and material gain is but a symptom of that social construct. Society is built upon the individuals’ desire to conform, to sympathise, and to be sympathised with. 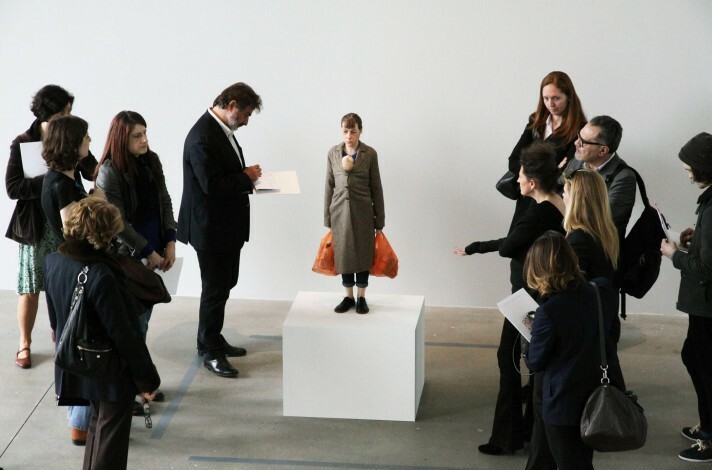 This curiosity and the desire for interaction can be linked further in ‘Mother with shopping’ by observing this work’s own unique touches and the audiences’ unique responses. The relationship between the mother and child bundled in her coat is of a normal depiction between real life parents and their children, while the bags of shopping in both her hands, a wrinkled face and slightly tired eyes invites immediate sympathy from the audience: this is depicting a hard-working mother. Artist Shen Yuan noted her response to the work as one of sympathy through similar experiences: she remembers holding her child in this same manner (“This is a detail of daily life…very powerful”). The shrunk scale adds to this effect by giving off a more intimate environment that invites the audience to observe the woman with a closer distance. (Tour video, 2013) As the various interpretations in the tour video has shown, the complex emotional signals that the work gives off in its intense realism has encouraged the audience to openly interpret and imagine increasingly involved backstories, imagining the fictional woman’s personality, wealth and life quality. In conclusion, the audience’s interaction with ‘Mother with shopping’ showcases the individuals’ open desire to find similarity in others, in order to empathise, and to be empathised with. To conclude, desire production is a contemporary constant of influence that is critiqued based on its ethical imperfections, whether it be the misleading nature of narrative-based advertising that has the ability to redefine a project’s mythical and symbolic meaning, or creating an entire market based on chance and money. However, it is imperative to note that desire is a primal construct of the human emotional spectrum, and artistic expressions of such a construct can be easily balanced as both positive and negative. Therefore, artistic critique on media-based desire production are responses to its inherent imperfections in terms of narrative inventions that alter behaviour, but also to explore the link between desire and its role in a community’s basic foundations. Hirst, D., Fuchs, R., & Beard, J. (2007). For the Love of God: The making of the diamond skull. London: Other Criteria/White Cube. Marsh, J (2009) ‘Jean Shin: Common Threads May 1 – July 26, 2009’. The Smithsonian American Art Museum. Twichell, J (2000). ‘Twenty Ads That Shook the World: The Century’s Most Ground-Breaking Advertising and How It Changed Us All.’ Chapter ‘De Beers: A Good Campaign Is Forever’. Three Rivers Press, New York. This is the second entry in my edited posts of essays from major uni research papers. I think the topic covered here will prove interesting, for anyone who’s interested in contemporary art AT ALL, or is just interested in some sophisticated visual analysis angles. Awesome post! A lot of interesting stuff here. I haven’t heard about Jean Shin or ’Chance City’ before, but I gotta say that i absolutely love it. Incredibly poignant and ice cold commentary on the desire and pursuit for money in our society, and I think it especially speaks to the more individualistic consumer culture that is present today as opposed to 30-40 years ago. It’s not about production anymore, but about the product. Advertisements tell you how their product is customized to fit YOUR personal demands and desires, trying to make you feel special from everyone else. You buy that lottery ticket in the hopes that YOU will be the winner so that YOU can become a millionaire. I feel like this is also kind of showcased in the different colors of all the tickets that the models consist of, like a facade of uniqueness which at the end of the day are all part of one entity. I also love how you pointed out the total cost of all the lottery tickets, since that really shows how much money can be spent on these things before finally getting the lucky one. Oh, and also the fragility of the work as a whole, and how that (as you mentioned) reflects how unstable and uncertain it is to invest in this sort of thing as a way of acquiring the dream or even just economic income. As for Ron Mueck, I’ve stumbled across him a few times before. Just on the surface level alone, his works are amazing visual experiences, and they really put the viewer in an interesting position with their hyperrealistic details yet unnatural scales. I don’t thing I’ve seen a work by him before though that’s on a smaller scale; usually, his stuff is much bigger than the human size. I bet it creates much more intimacy, and, as you wrote, evokes a lot of feelings of empathy and human connection. While Hirst’s and Shin’s works both comment on the grander scheme of human desire, I think ’Woman with Shopping’ is instead a work about mortality which confronts us with who we really are; just ordinary people carrying groceries on our way home, and neither diamonds nor winning at the lottery is going to change that in any significant way.